Christmastime is the season for remarkable birth stories, and while this tale involving a cute, pregnant momma cat may not be a catalyst that inspires its own holiday, the event is spinning Yultide revelers online into a catatonic state of awww. Danielle Lopez tweeted photos of her cat, a rescue named Tink, after the festive feline gave birth to a liter of adorable, furry kittens under the family Christmas tree. Danielle says she even named one of the kittens Jesus. The photos have grabbed the attention of pet lovers around the world with fans eager for updates about Tink and her new kitties! "She's been moved to a basket and the tree skirt has been cleaned," Lopez tweeted. Some online have been critical of the Lopez family for not spaying their cat, but Danielle wants people to know that her cat was pregnant when she was rescued. "These kittens have a very safe home," responded Danielle on Twitter. Need more Cuteness in your life? 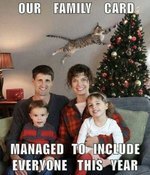 Scroll through our gallery of cats destroying Christmas trees, and then like us on Facebook to keep your newsfeed on point!